This is the time I live for. 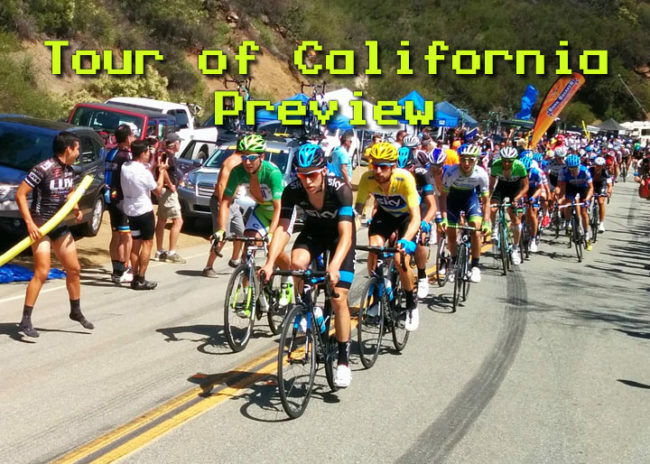 The Amgen Tour of California is finally here and every year it raises it’s profile. Even though it coincides with the Giro d’ Italia, you can argue that the ATOC has even better star power even with fewer UCI teams participating! It’s great to have Phil Liggett, Paul Sherwen and lately Jens Voigt entertaining us through the great coverage NBC Sports bring us(Tour of Utah: you have a lot of catching up to do). For this week, I’m going big. I even planned a few features in advance to get the hype going. And by features, I mean stuff that’s better that the regular slop I throw out there. Wednesday – Ask the Pros: What if the Tour of California was a Grand Tour? 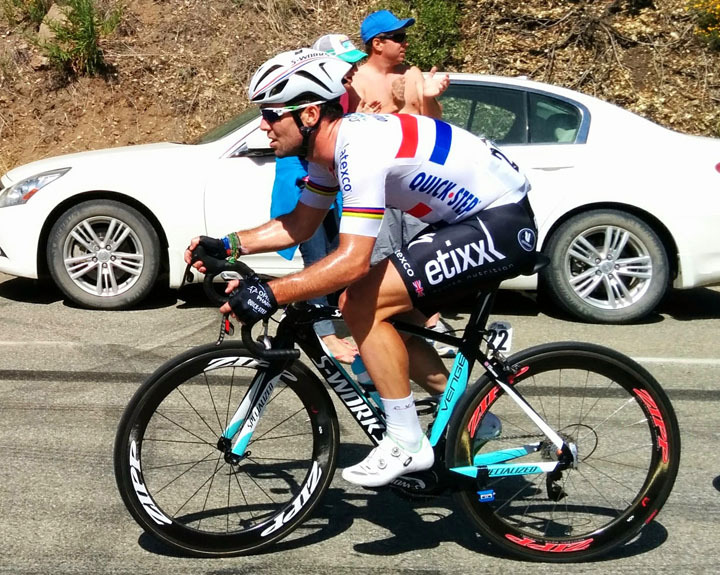 To start with the race preview, I’ll get my sourness out of the way wishing the race ended in LA again, just like it did last year when we had the most amazing finish ever with Peter Sagan needing millimeters to capture the yellow jersey. I also want to mention that while the women’s race is far ahead of others and has a pretty cool stage around Lake Tahoe, we’re still a long ways away from making things equal. If they were to televise their race in the same manner, I’d watch it just the same. Lastly, I’ll mention that the TOC has a pretty awesome app. I stay away from that digital poison most of the time, but with all their interactive information and live TV feed your work productivity down for eight days. This year, the race starts around Mission Bay in San Diego with a 107 mi loop heading out east with a Category 1 climb in the middle of the stage. There are a couple of sprint bonuses before and after the climb, so expect those to be hotly contested as those bonus seconds could come into play along with the expected sprint finish to see who’s wearing yellow after day 1. We know Mark Cavendish will want to wear yellow after Stage One. Stage two I’ll be going into more detail, but riders will be put to more climbing on this South Pasadena to Santa Clarita Stage. Climbing up Angeles Crest Highway and doing the Upper Tujunga loop will bring in Cat 1 & 2 climbs early before a long downhill into the valley. About two-thirds into the stage, racers will face a back to back Cat 2 climbs which may provide a breakaway opportunity to keep it from being a sprint finish. Days three through six should grab your attention because they bring what I think will be the four most critical stages for who will wear the final yellow jersey on network television Sunday. The third day will bring the Queen Stage with racing starting out in Thousand Oaks and ending up at the top of Gibraltar Road in Santa Barbara after 104 miles of racing. There’s a few climbs along the way, but I expect all the GC contenders to be grouped together before the final climb of 7.4 miles averaging 8% begins. The views of the coastlines will be stunning, the landscape will remind people of Spain and you’ll see teams whittled down as they try to keep their team leaders at the front. For those that want to stay in contention for the yellow jersey, they’ll have to finish around a minute of the leader. If Peter Sagan is going for the repeat, you’ll have to see him put in work here. Last year, he had to protect a lead on the Queen Stage, which was the race’s penultimate. This year, it comes far earlier, so we’ll see if he’s inclined to keep it close as he can make up time on later stages. Stage four doesn’t look like much on paper, but looks can be deceiving. It’s a relatively flat 134 mile stage largely rolling along PCH with a couple small climbs at the end. Then why do I think it’ll be tricky? You know all those coastal charity rides your friends go on? How come it’s always north to south? Winds! Yes, these racers will be not going in the optimal direction, meaning there could be great splits like the one that affected Nairo Quintana’s contention in last year’s Tour de France. Day Five takes us to the Sierras where goddamnit there should be three or four stages every year! The day starts near sea level in Lodi where the riders will do a long, gradual climb over the majority of the 131 miles of racing. About half the race will take place at over 6,000 feet of elevation, so the two Cat 2 climbs will be a gut check to see where everyone is at, especially when they go over 8,500 feet. The finish is a one mile, 5.9% climb where all the GC contenders will be emptying the tank to gain those precious few seconds. Friday brings a relatively flat, 12.8 mile time trial in Folsom which will be the last opportunity for riders to create big gaps in time. Peter Sagan crushed the makeshift TT last year and we have the current and former one-hour world record holders in Rohan Dennis and Bradley Wiggins, so this stage will be critical. The penultimate stage brings a decent amount of elevation(8,600 ft) over the 109 miles of racing, but all the significant climbs take place in the first two-thirds of the race. You’ll see a lot of great television shots of the northern coast, but with a circuit ending in Santa Rosa, expect a sprint finish with a possibility of this happening. 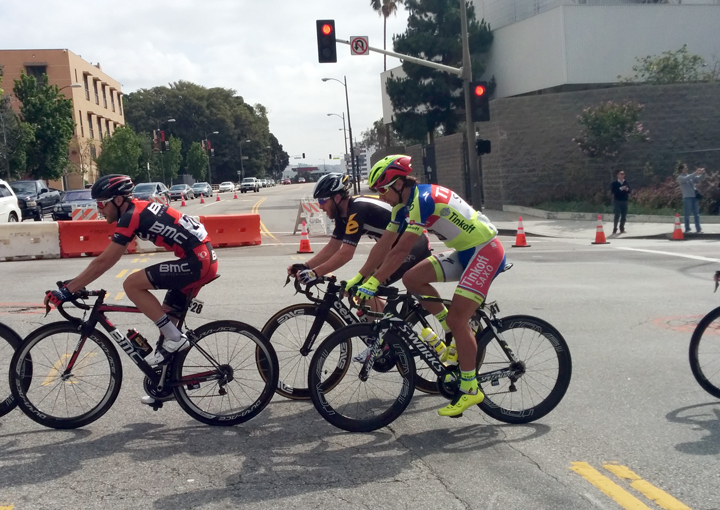 The race ends in Sacramento over a 85 mile loop where flat is almost to hilly of a word to describe the elevation. Without ever going over 35 feet above sea level, any changes in the GC will only be determined by the intermediate sprint and finishing time bonuses during the stage. 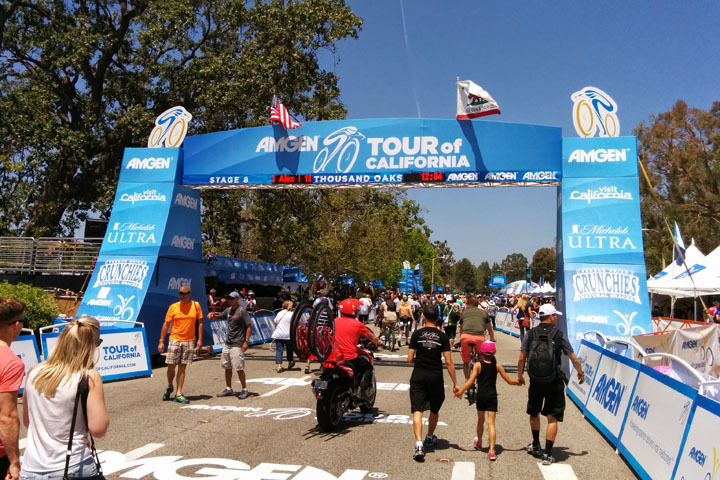 Why is the last stage of the ATOC always mostly flat? My thoughts are because it’s on national television. Just like when you watch the Ironman Triathlon, the network wants to ensure they can insert interesting content without viewers missing out on race action, except the final sprint. That’s why we’ll see a number of montages recapping the race’s previous stages, interviews and a few sponsor handshakes to make everyone happy. Still, the beauty of trying to sound like a know it all during this race preview can always be thrown out the door, like last year’s race when certain dynamics changed the nature of the GC.